Put it in a paper bag and wait. The one on the top I bought a few days ago. Still green. The one on the bottom has been in this brown paper bag for about a month. It started out as green as the one on top. It’s dried and wrinkled but it doesn’t affect the flavor. It just gets better. 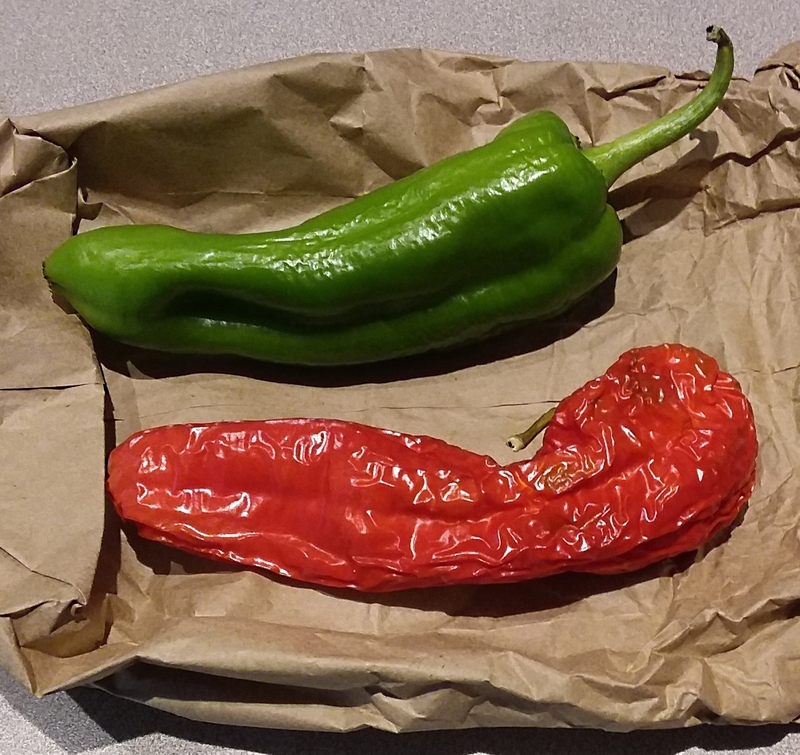 An Anaheim pepper is a mild variety of the cultivar ‘New Mexico No. 9’. The name ‘Anaheim’ derives from Emilio Ortega, a farmer who brought the seeds from New Mexico to the Anaheim, California, area in 1894. The New Mexico green chile pepper flavor has been described as lightly pungent similar to an onion, or like garlic with a subtly sweet, spicy, crisp, and smoky taste. The ripened red retains the flavor, but adds an earthiness and bite while aging mellows the front-heat and delivers more of a back-heat. The spiciness depends on the variety of New Mexico chile peppers. This entry was posted in Uncategorized on July 28, 2017 by Bix.